Adam Ondra has got Arco Rock Legends Award again today on the ceremony during Arco Rock Master for he is the first athlete ever to climb a 9c, the one is the cave in Flatanger, Norway. For Adama Ondru it is already the 6th award of Arco Rock Legends, 5x he got it for rock climbing, 1x for competitions. 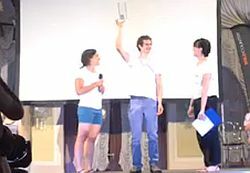 Salewa Rock Award: Josune Bereziartu (2006), Patxi Usobiaga (2007), Adam Ondra (2008), Chris Sharma (2009), Adam Ondra (2010), Adam Ondra (2011), Sasha DiGiulian (2012), Adam Ondra (2013), Muriel Sarkany (2014), Alexander Megos (2015), Wild Country Rock Award Daniel Andrada (2016), Margo Hayes (2017), Adam Ondra (2018). La Sportiva Competition Award: Angela Eiter (2006), David Lama (2007), Maja Vidmar (2008), Kilian Fischhuber (2009), Akiyo Noguchi (2010), Ramon Julien Puigblanque (2011), Anna Stöhr (2012), Mina Markovič (2013), Urko Carmona Barandiaran (2014), Adam Ondra (2015), Mina Markovič (2016), Janja Garnbret (2017), Romain Desgranges (2018). 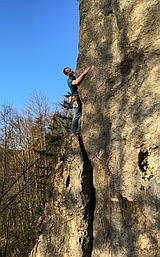 Winners of Dryarn Climbing Ambassador by Aquafil Award: Jerry Moffatt, Maurizio ‘Manolo' Zanolla, Luisa Iovane, Lynn Hill, François Legrand, Yuji Hirayama, Stefan Glowacz, Paraclimbing movement, Mauro Corona, John Ellison (founder of CAC – Climbers Against Cancer), IFSC, Mike Kosterlitz and Reinhold Messner. Bergauf (AUT), Montana (CZE), Desnivel (ESP), Klettern (GER), Panorama, (GER), UP Climbing (ITA), Montagne 360ｰ (ITA), Meridiani Montagne (ITA), Gazzetta dello Sport - PlayAlpinismo (ITA), Il Manifesto - In Movimento (ITA), Man and Mountain (KOR), Gory (POL), Risk (RUS).